Garcia Forest Service employees from left, Felix Matias, Efrain Martinez and Rubin Garcia plant Engelmann spruce above Vallecito Reservoir next to Middle Mountain Road near Bear Creek. 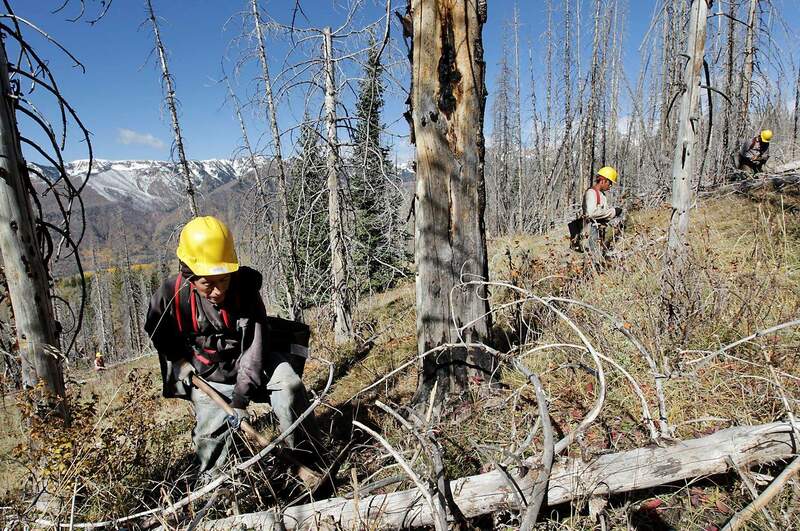 The crew was planting more than a 100,000 trees in the Bear Creek Fire burn area. The ideal Engelmann spruce to be planted is beginning to go dormant, so there is no stress on the tree going into winter. Ruben Garcia with Garcia Forest Service, digs a hole and clears grass as he plants a Engelmann spruce on Monday near Bear Creek above Vallecito Reservoir. A project is under way on Middle Mountain, the division between the Pine and Vallecito drainages, to see how effective replanting a fire-charred area is in capturing carbon dioxide. Automotive giant Chevrolet is paying for the reforestation of 250 of 1,800 acres that burned in the 2003 Bear Creek Fire. The company ultimately will receive carbon credits for the estimated 55,000 to 65,000 metric tons of carbon dioxide the trees turn into organic matter over 100 years. Seedlings become trees that stabilize the soil, prevent erosion, combat invasive weeds, create wildlife habitat and capture greenhouses gases. 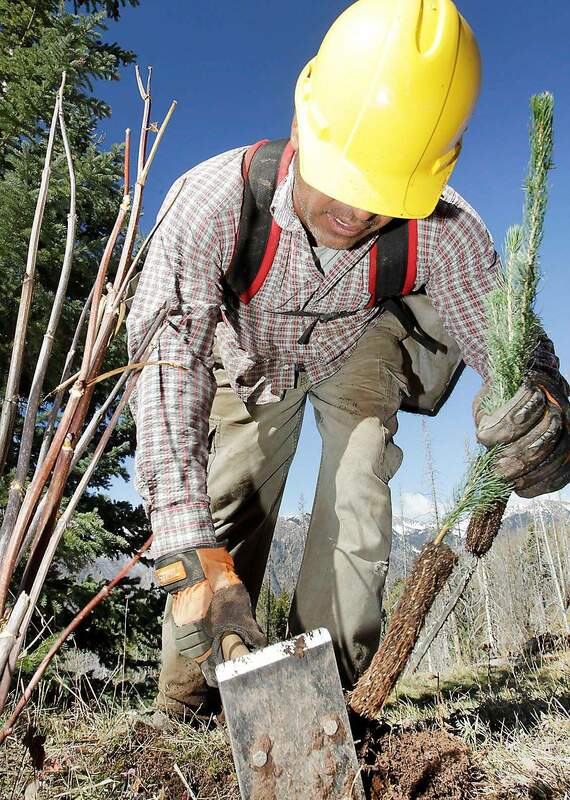 We were going to start a week ago, but there was six inches of snow on the ground, Gretchen Fitzgerald, a U.S. Forest Service supervisor said Monday as she watched a planting crew move methodically up the slope at 10,000 feet elevation. The crew members, Guatemalans on temporary work visas, swung Pulaskis  a tool with a double-headed blade, an axe and a grub hoe  to clear 16-inch circles free of forest debris to plant seedlings. The seedlings have to be located on the shady side of a log, shrub or rock and at least 5 feet apart. About 450 seedlings are planted per acre. Sergio Vasquez Carrillo made it look easy. Two or three whacks with a Pulaski opened a hole. A seedling was inserted, and the loose earth stomped into place. Then on to the next spot. Planting seedlings takes some know-how, said Fitzgerald, who randomly checked the finished work. Chevrolet is sponsoring the Middle Mountain project as part of its commitment to the environment, said Sharon Basel, the General Motors manager of environment, energy and biofuel communications. The company has environmental projects in weatherization and renewable energy as well as reforestation, Basel said. Chevrolet, a division of General Motors, has committed $40 million to environmental projects, Basel said. GM, meanwhile, in August reported a net income of $2.5 billion, compared with $1.3 billion in the same quarter a year earlier. It was GMs third consecutive quarterly profit since its initial public stock offering in November, and its sixth consecutive overall. On the environmental front, the companys goal is to remove 8 million tons of carbon dioxide. So far, its projects have taken 23,000 metric tons of carbon dioxide out of circulation and the company has as-yet-unfulfilled contracts worth 4.6 million tons of carbon dioxide. Eight million tons is the amount of carbon dioxide emitted in the generation of one year of electricity for 970,874 homes or the amount captured annually by 1.7 million acres of pine forest. Basel said Chevrolet doesnt reveal the amount invested in a particular project. Chevrolet is paying expenses related to only this years planting on Middle Mountain, Fitzgerald said. The company is covering the production of the seedlings, the cost of the planting crew and third-party verification of the carbon sequestration, Fitzgerald said. The reforestation here is expected to last three years if new funding sources can be found, Fitzgerald said. The goal is to replant 900 of the 1,800 acres burned in the Bear Creek Fire. Spots in the burn areas where aspen and spruce are coming back on their own wont be planted, either, Fitzgerald said. The seedlings are grown from seeds collected on the same terrain 20 years ago, Fitzgerald said. The cones are harvested and sent to the Bessey Nursery, a federal facility near Chadron, Neb. Only viable seedlings are returned for planting. 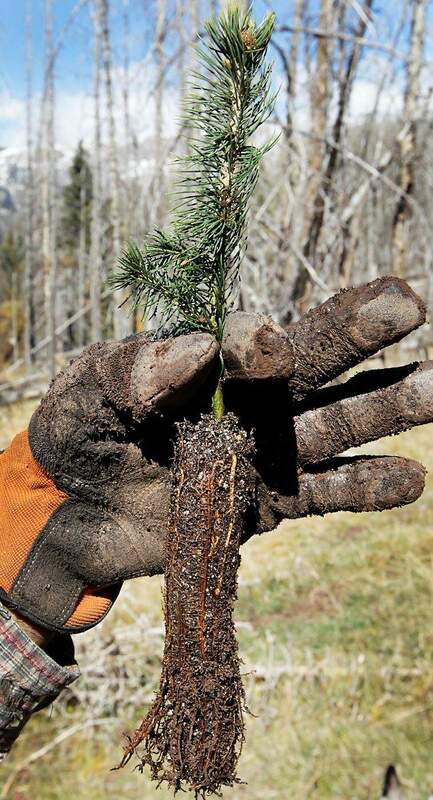 Seedlings will be planted along both sides of Middle Mountain Road about seven miles north of Vallecito. The National Forest Foundation is the middleman in the project, said development program coordinator Greg Peters. It links funding sources with environmental projects, and, in the Middle Mountain job, it was responsible for finding a planting contractor  Clear Crystal Maintenance of Albuquerque  and a third party to monitor tree growth and carbon sequestration every five years, Peters said. Clear Crystal found its planting crew through Garcia Forest Service in Rockingham, N.C.